Budo Karate is training for the mind, perhaps even more so than training for physical performance. Our programs are designed to improve focus, awareness, observation, patience, and mental processing.This training is equally important for students of all ages. Although we emphasize a balanced approach to training your mind and spirit, there is no lack of focus on improving our physical stamina, strength, balance, and agility. Our youth and adult students study Kyokushin karate – an arduous style of martial arts known for its physically strong participants. While sport and competition is a part of what we do, it is secondary to karate as a means of personal development. Karate is for life. It will help you to be safe, to endure, to succeed, and to grow. It is our goal to create in every student an indomitable spirit to overcome all obstacles and achieve our absolute best. For parents who want their children to develop the skills necessary to stay safe and succeed in life, we have programs for children from pre-school through high school and into adulthood. We provide safe age-appropriate karate training while focusing on the development of attributes that foster success throughout one’s life. The adults in our school study Kyokushin karate – an arduous style of martial arts known for its full-contact fighting and mentally and physically strong participants. This view can be deceiving at first; appearing to be violent and reminiscent of the “cage fighters” seen on television and practiced by professionals. However, our karate is centered on personal development and training avenues exist for all people. That development entails seriously practical matters such as real-life self defense and at the same time development of mental and spiritual fortitude. The greatest competition is against oneself, with the self of today pitted against those things about ourselves we wish to overcome or change. 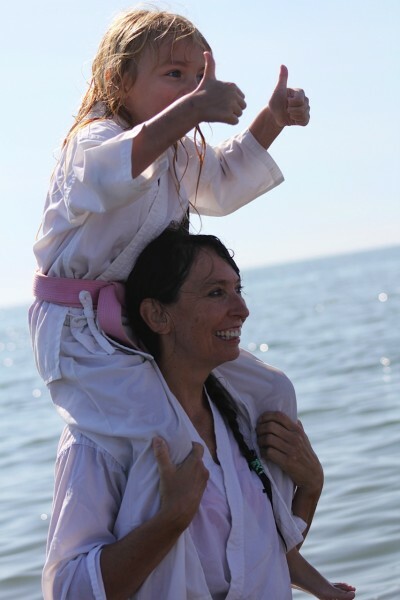 “Personally, I can say without hesitation that the greatest gift I have been given through karate is perseverance. There are many other gifts as well, but this one has served me well throughout my life in many circumstances. Never give up. “Fall down seven, get up eight,” 七転八起 (“Nana korobi ya oki”) is a Japanese proverb that tells us that no matter how many times we fall we must get up one more time. Sometimes I want to stay down; it would be so much easier. But something deep inside drives me to stand once again. I have little doubt that the practice of karate fostered this attitude in me. The metaphor of regaining my feet, taking a fighting stance, and raising my arms up in defense is one I visualize during the most trying times of my life. Not only standing, but sinking my weight into the ground, tightening my body into its center, breathing a cleansing breath, and staring into the eyes of my foe. I feel strength right now just from writing the words. The true feeling is indescribable. This is what I wish to pass on to others.